Hook up Surfing: Surf Instruction and Coaching, Surf Photography, and Surf Videography - Just a few testimonials from our satisfied customers. Just a few testimonials from our satisfied customers. My husband and I recently took our honeymoon to Oahu and decided to get some surf lessons from Ivan. We are so glad we did! We had such a great time and really learned a lot. By the end of the lesson, I was more confident than I thought I'd ever be out on waves! Ivan really gave us the skills and techniques and pushed us hard so that we could get the most out of it! I highly recommend taking lessons from Ivan or his team. You won't regret it. We will be returning! I wasn't sure how to submit a testimonial so I'm sending this email for you to post. Thanks so much for the wonderful lessons and experience during my stay in Oahu. Not only did I catch almost every wave you directed me towards but I really did learn surfing technique that will help be become a more advanced beginner. For sure I will be coming back for more lessons and highly recommend you to anyone out there looking for lessons. I have known Ivan and Jenn for about a year now and they are some of the most down to earth friendly people you will ever meet. They are highly experienced and have a natural way of teaching you that encourages you to perform at your best. 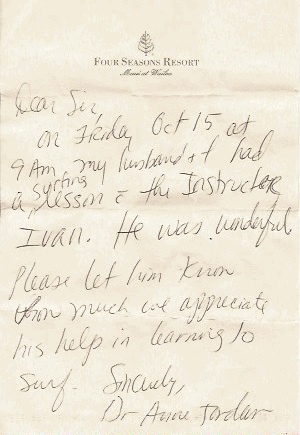 I have been instructed by Ivan at many of the South shore surfing spots and even on the North shore. Ivan and Jenn are highly trained and posses surfing skill sets that you can only see for you self to believe. When you are instructed by Ivan or Jenn, you know you are safe and in good hands. Ivan and Jenn are well respected on the Island and in the water as teachers and people. Both Ivan and Jenn have an ability to instruct you, not only about surfing but also about the ocean environment that surrounds you while you surf. They will make you never want to get out of the water and will inspire you to get better. Do not be surprised if you never want your surf lesson to end while being taught by Ivan or Jenn. You will soon realize when you begin your lessons with Ivan or Jenn that you have not only found the best instructors on the island but, you have also made new friends. I recommend Ivan & Jenn to anyone who thinks they want to learn how to surf either on vacation or fellow residents of Hawaii. You will discover the great passion of surfing and make two great friends in the process. Thanks for the great lesson. I surfed every day untill I left for cold Michigan. It was a very positive experience, in meeting you. Hopefully we can Hook Up again if I ever make it back there ! I cant explain how happy I am that stumbled upon your website last February. I had so much fun surfing with you and you and Jenn made my stay in Hawaii amazing. When I signed up to surf for one whole month with you, Ivan, never did I imagine that I scored a professional yet fun instructor who made every surf lesson enjoyable, no matter if it was a cloudy day with horrible onshore winds. You are a great instructor. You made me feel secure when the waves looked humongous, taught me about the ocean and the surf, and motivated me to keep paddling when my arms were like noodles. I learned so much from you and after every surf lesson I felt like the happiest person on the planet. Also, thank you for treating me like a friend. Many of my laughing moments on Oahu involve you, Ivan. My stay in Hawaii wouldn’t have been the same without you and Jenn! Cannot wait to surf with you both again!